2-Finger Adaptive Robot Gripper Provides Versatility and Agility. By recepeken on October 23, 2012 Domestic / Industrial · Comments Off on 2-Finger Adaptive Robot Gripper Provides Versatility and Agility. 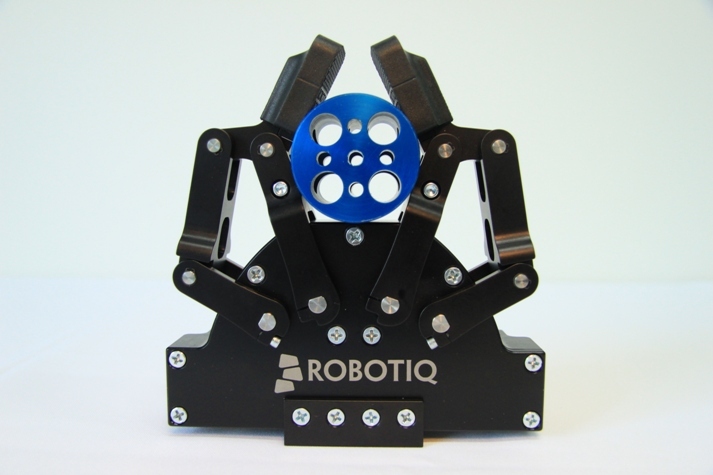 Robotiq Extends the Adaptive Robotic Gripper Product Line for Manufacturers with High-Mix Automation Challenges. 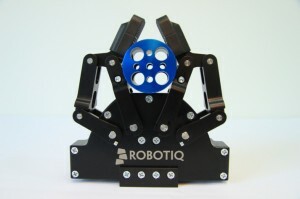 Robotiq announced the availability of the 2-Finger Adaptive Robotic Gripper, an innovative new gripper, which joins the existing 3-Finger Adaptive Robotic Gripper in providing unique agility and versatility in handling a wide variety of parts with a single gripper. Today’s manufacturers are under relentless pressure to reduce costs, increase agility and automate more processes, including the high-mix, labor intensive ones. However, existing technologies such as tool changers provide only limited and expensive solutions when it comes to handling different parts. “Today’s automated assembly and part transfer processes require a high degree of flexibility to deal with a high-mix of parts,” says David J. Marak, Application Engineer at Adept. “The 2-Finger Adaptive Gripper is a very flexible tool that can eliminate costly changeovers and provide significant benefits for many of our customers”, he continues. “We had to load a resistance nut welding robotic cell with over 30 different parts”, says Steve Spanjers, Director of Engineering at Marwood Metal Fabrication – an automotive OEM metal stamping company. “Having to design several custom grippers was a big concern. We found the 2-Finger Adaptive Gripper to be a flexible solution to grip all our parts, reduce our tooling costs and eliminate time consuming changeovers”, he remarked. Three distinct gripping modes – parallel, encompassing and inside – enable handling of different part geometries including flat, square, cylindrical and irregular. High payload to weight ratio coupled with long stroke enable handling of a variety of sizes in a compact form factor. Precise speed and force controls enable handling of parts of different rigidities, ranging from brittle, to deformable, to stiff. Accurate finger control enables fast cycle times through partial open/closing. Robotiq designs and manufactures Adaptive Robotic Grippers that enable manufacturing companies dealing with high-mix production to automate manual tasks and maximize their ROI. Based in Quebec City, Canada, we work in partnership with robot manufacturers, system integrators and end users. Robotiq is a privately held company founded in 2008.